The Ffwrnes TheatreDaring to be different, the Ffwrnes is a new creative and cultural centre for the performing arts, media & community events. It comprises of a state-of-the-art auditorium, specially designed to accommodate a broad range of performances, film screenings, conferences and cabarets, live gigs, “eisteddfodau” or even a traditional Twmpath Dawns or Tea Dance! With an audience capacity of up to 500 and 650 for unseated events, the space can be rearranged to accommodate a number of different seating formats as required. 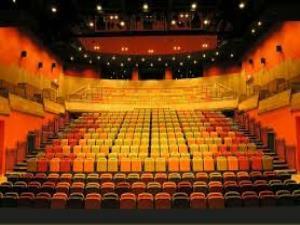 With excellent access facilities for people with disabilities, a centrally located box office and a spacious foyer coupled with modern backstage facilities, the Ffwrnes is one of the best equipped and energy efficient theatres of its kind. Daring to be different, the Ffwrnes is a new creative and cultural centre for the performing arts, media & community events. It comprises of a state-of-the-art auditorium, specially designed to accommodate a broad range of performances, film screenings, conferences and cabarets, live gigs, “eisteddfodau” or even a traditional Twmpath Dawns or Tea Dance! With an audience capacity of up to 500 and 650 for unseated events, the space can be rearranged to accommodate a number of different seating formats as required. With excellent access facilities for people with disabilities, a centrally located box office and a spacious foyer coupled with modern backstage facilities, the Ffwrnes is one of the best equipped and energy efficient theatres of its kind. An important additional feature of the Ffwrnes is a cultural & social enterprise centre. Canolfan Sbarc provides accommodation and project partnerships for organisations and practitioners who recognise and promote the performing arts & media as effective tools for social change. As one of Theatrau Sir Gâr’s strategic partners, the University of Wales Trinity St David’s also has a strong presence at the Ffwrnes which clearly symbolises the close links between the community, the cultural sector and Higher & Further Education establishments in the area. From the East: From the M4 follows the A4138 towards Llanelli Town Centre. At Trostre roundabout take the 5th exit onto the A484, at the next rounder bout take the 1st exit continuing on the A484. Once you get to the next roundabout you will see the Travel Lodge in front of you, take the 3rd exit into the East Gate car park. If you’re using a SatNav please use SA15 3YF as this will take you straight to East Gate car park. From Carmarthen (West): From Carmarthen follow the A484 towards Llanelli. Once you get into Llanelli Town Centre bear left at the traffic lights at Gelli-Onn (this is just after Hall Street Church) take the right hand lane. At the next traffic lights at top of the hill bear right onto Thomas Street, this will take you behind the Ffwrnes. At the roundabout take the 4th exit into the East Gate car park.